Digestive enzymes are chemicals that help break down the nutrients in food into smaller particles that the body can absorb and use for its many physiological functions. You name it, digestive enzymes are key players in getting you the nutrients you need from what you put in your mouth. They are essential for good digestion and good health. ...the food will pass through you, but not before causing a host of unpleasant digestive complaints and potentially health-damaging conditions, many of which are allergic in nature because the wrong things get absorbed. Who would have thought? All that havoc, because undigested or partially digested byproducts of your food are knocking around inside you. Most of us never give digestive enzymes a thought (you are an exception because you’re reading this). They are key, however, to obtain the nutrients you need from your food and, it appears, avoid allergic reactions to molecules your body is not designed to encounter. The last can have serious knock on effects with your health including possibly contributing to auto immune disease like lupus, multiple sclerosis, and fibromyalgia among others. So read on, if you want the scoop on the benefits of digestive enzymes. What is digestion? Digestion is the process by which the body breaks down the large molecules in food into smaller molecules that can be absorbed and metabolized by the body. Carbohydrates, amino acids and fatty acids are examples of these smaller molecules that the body can metabolize. Benefits of Digestive Enzymes: What are enzymes? Enzymes are catalysts - substances that trigger, but are not consumed, by a chemical reaction. Digestive enzymes are essential for the breakdown of food into, among other basic components, carbohydrates, lipids and amino acids – the fuel, mortar and building blocks for the body and its many systems. What are digestive enzymes? Digestive enzymes are substances that help your body break down (digest) foods into smaller particles that your body can absorb and use to function including building, repairing and maintaining tissue, hormones and everything else you expect your body to do for you. It’s a tall order but you won’t have good health without enough of them that function. Enzymes don’t work alone. They are the trigger or sparks for chemical reactions but need helpers to work, including vitamins and minerals and substances like stomach acid and bile. It’s another reason why a healthy balanced diet is important to ensure you get all the nutrients your body needs and why a multivitamin multi-mineral is wise insurance , in the event you don’t. Whatever your diet, you should make sure it can give you the benefits of digestive enzymes. Ptalyin and amylase break down starches into simpler carbohydrates and sugars. Other enzymes that participate, depending on the type of sugar involved, include disaccharidases, lactase and sucrase - the end game is sugars including glucose that the body can use for energy. Lipase digest fatty foods – the result are fatty acids (like Omega 3 and Omega 6s among others) and glycerols that are incorporated in the cell membrane, and are key to the function of neurotransmitters and production of steroid hormones, among oodles of other physiological functions. Pepsin and protease, along with trypsin and chymotrypsin are enzymes that target proteins and break them down into amino acids the building blocks of the body tissue and essential for many chemical reactions that keep you humming. Other less well known digestive enzymes include ribonuclease – that digest nucleic acids and deoxycyribonuclease-I which digests DNA and nuclease. Because many foods and most meals are a combination of carbs, (aka starches), proteins and fats, you need enough of all the digestive enzymes to get the most from your food. Deficiency in even one digestive enzyme, including any cofactors, coenzymes or nutrients needed by that enzyme to function, may result in the body dealing with molecules that it is not designed to encounter. This poor or incomplete digestion initially may result in gas, bloating, diarrhea and a permeable or leaky gut but lead to myriad health problems including vitamin and mineral deficiencies. As an increasing number of undigested or partially digested molecules enter the blood stream, allergies as well as serious knock on health problems including inflammatory and autoimmune conditions can take place. Yikes! This is why it’s key to ensure you’ve got enough digestive enzymes and that they’re doing their job. Eating enough enzyme rich foods and taking digestive enzyme supplements can play a role in ensuring you reap the benefits of digestive enzymes. Benefits of Digestive Enzymes - Health conditions linked to inadequate or improperly functioning digestive enzymes. Symptoms and Conditions Related to Insufficient Digestive Enzymes. *Autoimmune conditions where lack of digestive enzymes are implicated. Benefits of Digestive Enzymes: Autoimmunity and digestive enzyme deficiency. The link between insufficiency of pancreatic digestive enzymes and autoimmunity is theoretical at this point, but a powerful theory worth exploring. In summary, the lack of specific digestive enzymes results in molecules from partially digested food in the blood that shouldn’t be there and against which the body mounts immune responses. The result of these reactions can manifest, depending on the food molecules and enzymes involved, as specific autoimmune diseases including lupus, Hashimoto’s thyroiditis, multiple sclerosis, fibromyalgia, rosacea, myasthenia gravis. Check out the following book Autoimmune ﻿﻿﻿﻿﻿by Annesse Brockley and Kristin Urdiales 2011 for more information about the link between digestive enzyme deficiency and autoimmune conditions. The book is a good example of out-of-the-box interdisciplinary thinking, rare with the hyper specialization in medicine today that discourages doctors from exploring the links between seemingly unrelated conditions, when outside their field. As a long term sufferer of Hashimoto’s thyroiditis, which increases my risk for other autoimmune diseases, this is exciting stuff - especially, since diet can play an effective role in improving one’s digestive enzyme status. The pancreas is a leaf shaped organ that produces the mother lode of digestive enzymes. It also produces hormones including insulin needed to control blood sugar. Alcohol, certain drugs and inflammation can cause pancreatitis, a painful condition that can block the flow of enzymes into the small intestine. This can cause the digestive enzymes to activate prematurely before reaching the intestine and damaging tissue. If the link between autoimmunity and digestive enzymes is established definitely, it will radically change how we manage autoimmune illnesses and shift the focus on diet. The benefits of digestive enzymes, acquired through an enzyme rich diet and/or enzyme supplements will be something health conscious people do as a matter of course – like we consume calcium and magnesium rich foods to ensure good bone health or anti-oxidant rich fruit and veg to boost immunity. The benefits of digestive enzymes for overall health including lowering ones risk of cancer and diabetes and other lifestyle disease is explored in Dr. Hiromi Shinya’s The Enzyme Factor. As we’ll see later, many traditional foods from disparate cultures have been eaten for centuries are enzyme rich and have likely been the way that many have got the benefits of digestive enzymes without thinking about it. Benefits of Digestive Enzymes: Which enzymes are used when and for what? Digestion and the function of digestive enzymes are not a one- time event but a process that happens at all stages of the digestive process. Think of the digestive process as a street parade with lots of performers doing their bit along the route. You wouldn’t want to miss any of it – lest you miss the grand effect. Enzymes are released and used at many stages of the digestive process, starting in the mouth, and continuing in the stomach, the duodenum, small intestine and colon. Enzymes are like the clowns and jugglers who amuse the parade goers while the various floats and music bands march by. While the clowns aren’t the main crowd draw, it wouldn’t be a circus parade without them. Digestive enzymes are the same! Benefits of Digestive Enzymes: The Macy’s Day Parade of the body – the digestive process. To illustrate the effect and benefits of digestive enzymes, let’s take walk along the digestive process parade route. It starts in the mouth, with chewing. Chewing releases saliva which contains ptalyin a digestive enzyme that starts the digestive process by breaking down starch foods. Starches, also known as carbs and include simple and complex sugars. are found in plant based foods like grains, legumes, fruits and vegetables. … But we’re not done – there is more. – Your mother was right, chewing well is good for you. Specifically, chewing releases ptalyin that breaks down carbohydrates into smaller molecules. It also ensure there is more surface area to your food so the digestive enzymes and other juices further down the digestive pike have an easier chance of making doing their job. It’s hard to do when the food is in large chunks – as opposed to semi liquid. Aim to chew at least 20 times each mouthful until it is liquid…. Just think how all that chewing can make for quiet, if not romantic, candlelight dinners. When that food morsel hits the stomach, hydrochloric acid mixes with pepsinogen, to form pepsin an enzyme that targets protein foods. This is why enough hydrochloric acid is key for digestion and the function of digestive enzymes. Hydrochloric acid also kills pathogens that might otherwise pass into your blood to cause dysfunction and disease. Pepsin is the only enzyme that digests collagen, a protein and major element of meat. Unfortunately, hydrochloric acid levels (as well as digestive health) often diminish with age, so it is important to nurture the stomach acid you have. The problem is many people don’t and low levels are common. Widespread use of antacids for either heartburn or calcium supplementation is one of the biggest causes of low stomach acid levels and poor digestion. Avoiding antacids is an important step to maintain good digestion. Sipping a small amount of diluted apple cider vinegar with your meal can also help Hydrochloric acid supplements are also available. See the Benefits of Calcium if you want alternate ways than antacids to boost your calcium intake rather than antacids. Why you shouldn’t treat gas and bloating with antacids? While marketed as an effective way to prevent gas and indigestion, chronic use of antacids ironically can have the opposite effect and increase symptoms of indigestion … and more antacids. Spot the vicious circle? Antacids neutralize the stomach’s acidic environment which, among other things, is essential for the production and function of digestive enzymes. As food leaves the stomach, it enters the duodenum, the first part of the small intestine. Here the benefits of digestive hit their stride. 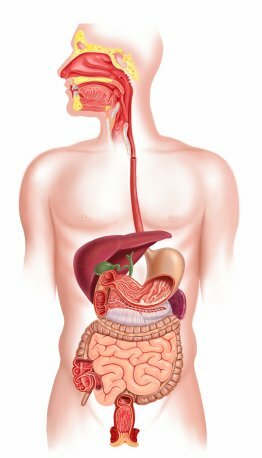 The pancreas (a leaf shaped organ that produces the mother lode of enzymes along with the hormone insulin) releases a cascade of enzymes into the duodenum where food is mixed and ground further. Amylase targets starches and sugars that began digestion in the mouth. Protease targets protein foods along with trypsin and chymotrypsin. Lipase is the pancreatic enzyme that digests fats but it doesn’t do it alone. Before the lipase can do its job, the fatty foods are mixed with bile produced by the liver and released by the gall bladder into the duodenum. Bile prepares the fat to be digested with the help of lipase. What is bile? – Bile, produced by the liver and stored in the gallbladder is a mix of lecithin, cholesterol and alkaline salts that emulsifies fatty foods and aid in their digestion. It is released when fatty foods are eaten. People who have their gall bladders removed have less bile and may benefit from supplementing digestive enzymes as well as reducing the amount of fatty foods they consume, lest they overwhelm their system. As the food passes through the rest of the small intestine (the jejenum and ileum if you wanted to know), mucus and small amounts of additional enzymes released at this stage further digest proteins, fats and sugars. When the products of digestion hit the large intestine, the digestive process keeps on trucking. It’s as this stage that water is extracted from the feces – too much extracted can result in constipation; two little can lead to diarrhea. While the body doesn’t produce it and relies on food or supplements to supply, the enzyme cellulase is found in the colon and digests or breaks down fiber. While we can’t “digest” fiber, the gut bacteria that inhabit our colon can. Research has confirmed the importance of healthy gut flora for overall health as well as preventing certain systemic conditions including chronic inflammation. It is why getting enough fiber rich food and fiber digesting enzymes is important and why people often take a prebiotic supplement containing oligo-saccharides to help feed the gut flora? Spotlight on Rosacea - researchers at Univ. of California have linked incompletely digested proteins with the inflammatory skin condition rosacea that can leave sufferers with inflamed -looking skin on their face. There are several reasons for this including lack of the digestive enzyme lipase and lack of bile or related gallbladder problems. a colon with sufficient prebiotic fiber to maintain healthy gut bacteria to put the finishing touches on digestion. How to Improve Fat Digestion? Lecithin! If you have a problem digesting fat, perhaps because your gall bladder doesn’t produce enough bile, supplement lecithin granules during or shortly after eating. Bile contains lecithin that emulsifies fats so the digestive enzymes lipase can do its job. Lots can go wrong in this digestive process, especially when digestive enzymes are insufficient or don’t have enough of the right nutrient helpers to do their job. Benefits of Digestive Enzymes: Do you have enough? How do you know, if you are deficient in digestive enzymes and won’t reap the benefits of digestive enzymes? Depending on what enzymes are deficient, you may have gas, bloating, constipation, belching, diarrhea or stomach aches. Chronically poor digestion can lead to leaky gut syndrome, allergies and other conditions. They are a sign, you may not be getting the benefits of digestive enzymes. What is leaky gut syndrome and who cares? Leaky gut syndrome is when the lining of intestinal tract becomes permeable, due to illness, certain medication, poor diet, and conditions like celiac disease. The problem with a permeable gut wall is that improperly digested food molecules can be absorbed into the blood stream when they ought not. The body is not designed to handle these molecules that the body sees as “foreign”. The result can be a cascade of health problems including allergic reactions, heightened immune response, and inflammation that together may lead to disease including autoimmunity. The addition of digestive enzymes, either through enzyme rich foods or supplements can help. Lactose Intolerance– Many people lose the ability to digest lactase (the sugar in milk) by adulthood and suffer digestive ills when they do. Asians and Blacks have higher rates of lactose intolerance than Caucasians with 90% of adult Asians being affected and about 10% of adult Caucasians. Aside from avoiding dairy, lactase-free dairy products or lactose supplements are options for those who want dairy. Many lactose intolerant people can consume fermented dairy products with no ill effects. Pancreatin extracts made from pork or ox bile. These help digest carbs, proteins and fats. Papain made from papaya to aid protein digestion. Bromelain from pineapple to aid fat and protein digestion. Lactase for those who are lactose intolerant and can’t digest dairy foods. Does the Digestive Enzyme Supplement Work? You can test the effectiveness of a digestive enzyme supplement by dissolving it in water and immersing a target food in it. If your food liquefies in an hour, it works. So what foods are best to reap the benefits of digestive enzymes and how should you prepare them? Raw fruits and veg are chockablock with enzymes but the key is to chew well and consume raw. Heating destroys most enzymes. Papaya and pineapple are particularly enzyme rich as well as wheat grass and spirulina. Raw veggie dips like guacamole are good sources too along with raw smoothies and fresh juices. Raw (unpasteurized) Milk and fermented cheeses made from raw milk. Sushi including both raw fish and seaweed. Fermented foods are valuable sources of enzymes with traditionally made kefir top of the list but also traditionally made sauerkraut, pickles, kim-chi, tempeh and tamari (soy sauce)and sourdough bread and others. Most cultures have one or two versions of enzyme-rich fermented or cultured foods. Sprouted or soaked seeds, nuts and grains are good enzyme sources including bean sprouts, rolled oats (uncooked muesli or rolled oats that have been soaked overnight) as well as soaked raw almonds. Preserving Enzymes in your Food Heat destroys most enzymes so raw foods are best – ensure you sprout seeds, nuts, beans and grains to activate and increase bioavailability of enzymes. Pasteurization is a high temperature heat process that destroys most enzymes in milk. So, if your aim is to maximize enzyme content in dairy, obtain raw milk from a reliable source. Traditionally fermented foods like yogurt, kefir, tempeh (fermented soy ), tamari (fermented soya sauce), kimchi (Korean pickled vegetables), pickles, sauerkraut and kombachu (a fermented sweet tea) contain enzymes and are a great way of boosting your natural stores. Many of these traditional fermented and cultured foods have been used for thousands of years, both to preserve food without refrigeration and…. we now know… replenish and enhance our stores of health-protective digestive enzymes. Avoid the commercial versions of the above products that have not used live cultures or traditional fermentation processes, because the enzyme quantity will suffer or, in many cases, be non-existent. In the case of dairy products, raw milk is best, because pasteurization kills most of the enzymes. Eat sprouted seeds, nuts, legumes and including mung beans, sunflower, pumpkin and alfalfa and soak dried grains like rolled oats or nuts including almonds overnight to substantially enhances their digestibility and enzyme quality. Soaking the kernels in water will make them sprout and activate the enzymes, which lie dormant until the seed kernels are moistened. This is the same concept of a seed requiring moisture before sprouting and growing in the wild. Obtaining the Benefits of Digestive Enzymes from Almonds - In order to get the benefits of digestive enzymes from almonds, try this trick. After soaking almonds for several hours, heat at low temperature in oven until dry and store in a sealed container. If you don’t dry by heating, they will mildew. Been there! Meat broths that have been prepared traditionally using the bone are good sources of enzymes. Anyone for chicken soup? For superb recipe ideas for foods chockablock with the benefits of digestive enzymes, check out Sally Fallon’s Nourishing Traditions. Benefits of Digestive Enzymes: Top ten tips for enhancing your own digestive enzymes and those in your food. Getting the Benefits of Digestive Enzymes - Top Ten Tips to Enhance the Quantity and Quality of Digestive Enzymes in you and your food. Chew well – The first phase of digestion starts with chewing that triggers ptalyin digestive enzymes that target carbohydrates. As well, chewing helps enzymes and other digestive juices make more thorough contact with food by expanding surface area. Don’t gorge but consume small servings at each sitting to avoid overwhelming the enzymes you have. Think of your stomach as an exclusive boutique where customers (food particles) need exclusive undivided attention from enzymes and their helpers (the staff). Digestion is no place for a rowdy crowd! Soak legumes and grains including rolled oats for several hours to activate these foods’ digestive enzymes like with muesli . Eat fermented foods like traditionally made yogurt, kefir, soy, kimchi, pickles and sauerkraut to boost enzyme numbers. Sprout nuts, seeds and legumes to activate their enzymes and make them bioavailable. Ensure enough effective stomach acid by avoiding antacids and eating your food along with a small amount of diluted apple cider vinegar. Take a digestive enzyme supplement many contain papain or bromelain or are combined with prebiotic fiber like oligosaccharides. Take lecithin supplements, if you have problems digesting fats or have gallbladder problems. Take lactose or consume lactase-free dairy products if you are lactose intolerant and want to eat dairy. Often those who are lactose intolerant can consume traditionally fermented raw milk yogurt, kefir or cheeses without symptoms. In case you missed it the first time, chew, chew, chew. It’s the most efficient and cheapest way to improve the function of your digestive enzymes and overall digestive health. Enjoy your food and your good health with the benefits of digestive enzymes. Links to Further Reading about the Benefits of Digestive Enzymes and related matters to health and food…. Press here for more about a Healthy Balanced Diet. Press here for more about the story behind the new food pyramid , MyPlate. Press here for more about Calories. Press here for more about Anti inflammatory Diets. Press here for timely news on health and nutrition in the Healthy Diet Blog. Press here to return to Healthy-Diet-Healthy-You.